In the event of a flood, the things you worry about most are yourself, your children, and of course, your animals. When extreme rain and flooding took place last fall across the East Coast, thousands of people had to flee their homes. Unfortunately, that wasn't the case for one dog who got left behind. When Alex Scroggins of Conway, South Carolina was helping his sister and mother collect all they could from their devastated homes, he noticed a dog whining and barking on a nearby porch. He assumed the animal’s owner was close by and continued his efforts (along with a few friends) on his small boat. But as the floodwaters continued to rise, the dog remained on the porch and it looked like no one was coming to save him. Scroggins asked around and learned that the dog’s owner had left him there a few days earlier. The dog was becoming more frantic and scared by the minute. Scroggins knew he needed to help or the abandoned dog would die on that porch. (The Dodo). When he approached the dog, Scroggins said he was a bit skittish at first but once he put his hand out, the dog calmed down and let Scroggins pet him. He picked him up and led him to safety on the boat. 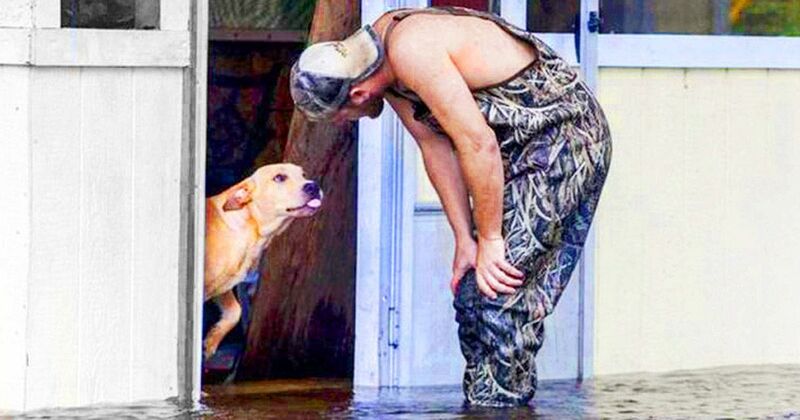 By the time Scroggins rescued the dog, whom he named “Lucky”, he barely had a dry place to stand and easily would’ve been swept out if left there any longer. (The Dodo). Scroggins was able to carry Lucky to safety and began looking for no-kill shelters for him to stay. But thanks to the severe flooding and destroyed homes, all shelters were completely full. Scroggins decided to bring Lucky home with him for the night where he cleaned him up and fed him. “He was happy to be safe,” Scroggins said. (The Dodo). The following day, Scroggins learned after talking with some neighbors that the person who abandoned Lucky had no interest in getting him back. And to make matters worse, this wasn’t the first time one of their animals needed rescuing. "The owner who left the dog knows I have him, but he doesn't care. He didn't even ask about him," said Scroggins. "He had another dog before that needed to be rescued by the Humane Society because he left him tied to a tree outside without food. I don't think he cared if Lucky would die out there. He had time to come get him, but he didn't. Who would do that? I'd get my dog before I got anything else." (The Dodo). Scroggins never planned on getting a dog but as luck would have it, Lucky will never have to worry about being abandoned again. Although he may not have had much of a choice. Scroggins says Lucky seems to understand what happened and refuses to leave Scroggins side. "It makes me feel better knowing the dog is in a better place than he was. If you see someone in need of help and you can do something, then do something — that goes for people and animals. If you can help out, try. That's what I hope people take away from this." (The Dodo).